If it seems a bit like déjà vu, it’s because it kind of is. 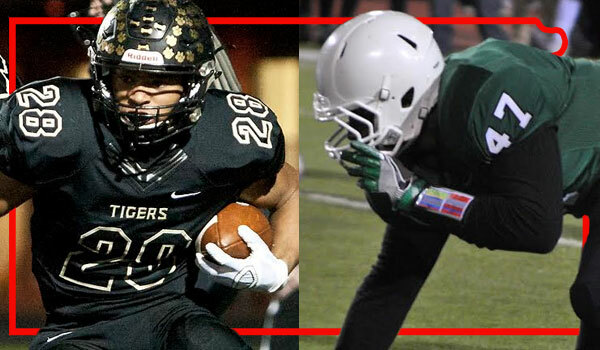 For the second consecutive season, the Derby Panthers (12-0) and the Blue Valley Tigers (12-0) will face off in the Class 6A state championship game in Emporia. Derby topped Blue Valley 27-14 last year. Now, the Panthers will try for their second consecutive state title and their third in the last four seasons. Derby enters the matchup on a 22-game winning streak. The Panthers have rolled through their competition this season, outscoring their opponents by an average of 55.3 to 12.1. Derby’s closest game was a 26-point margin when it defeated Hutchinson 46-20 in the fourth week of the season. In Week 2, the Panthers topped Goddard, which is playing in this weekend’s 5A state championship 35-6. The game lasted only one half, because of inclement weather. Derby marched through the playoffs in similar fashion. The Panthers topped Wichita North (62-0), Wichita Northwest (65-28), Hutchinson (40-7) and Lawrence Free State (49-21) to give themselves a chance at defending their title. The Panthers boast a balanced offense, averaging 219.0 yards on the ground and 217.9 yards through the air. Senior quarterback Dan Dawdy has completed 147 of 232 passes for 2,547 yards with 33 touchdowns and four interceptions. Kenyon Tabor, who has verbally committed to play for the Kansas Jayhawks, is Dawdy’s top target with 60 receptions for 1,128 yards and 11 touchdowns. Other options in the passing game include Kai Lemons (30 receptions, 417 yards, 9 TDs) and Michael Littleton (26 rec., 475 yds, 7 TDs). Junior Brody Kooser leads the Derby rushing attack with 1,543 yards and 31 touchdowns on only 189 carries. He’s rushed for more than 200 yards three times this season. Dawdy has added 400 rushing yards with 10 touchdowns. The Derby defense has pitched two shutouts and held opponents to seven points or fewer six times. Blue Valley will try to avenge last year’s loss in the state championship and deliver the school its first state title since winning Class 5A in 2013. Despite Blue Valley’s undefeated record, the Tigers have experienced several tough games this season. Blue Valley opened the year with a 35-28 win over Bishop Miege, which is playing this weekend for the Class 4A Division I championship. The Tigers also have victories over Mill Valley, which will play in the 5A title game, as well as St. Thomas Aquinas, Olathe South and Shawnee Mission East. Last week, Blue Valley nipped Shawnee Mission East 35-34 in overtime. Tigers quarterback Matthew Dercher tossed a 10-yard touchdown pass to Harrison Van Dyne to pull within 34-33. Blue Valley opted to go for the win, and the Tigers capitalized when Dercher connected with Blake Brown on a two-point conversion pass. Dercher leads a balanced Blue Valley offensive attack, which averages 245.2 yards through the air and 202.2 on the ground. The senior quarterback has completed 196 of 314 passes for 2,919 yards with 34 touchdowns and five interceptions. Van Dyne is the go-to option with 60 catches for 1,004 yards and 11 touchdowns. Cade Green (39 rec., 692 yds, 7 TDs), Gus Gomez (30 rec., 411 yds, 6 TDs), Brown (24 rec., 243 yards, 3 TDs) and running back William Evans (23 rec., 348 yds, 5 TDs) provide Dercher with several other effective targets. Van Dyne has offers from Missouri State, Tulane and Wyoming. Evans is also a dynamic runner with 1,575 yards and 21 touchdowns on 272 carries. The Blue Valley defense sports three players with 100-plus tackles in Michael Maffry (169), Ashkon Saravi (138) and Zach Gill (112). Gomez leads the secondary with five interceptions and two pass deflections. Last year, Derby quarterback Brady Rust rushed for 309 yards during the state championship win over Blue Valley. The Tigers were limited to 149 yards of total offense.